A 6/52 McEvoy St, Waterloo NSW 2017. Edval Timetables is an Australian company. We work with schools across all state and territories of Australia and also in the UK and Ireland. Our products grew initially out of a research project at Sydney University. Edval now has a team of passionate and committed timetabling consultants serving our schools across Australia and beyond. 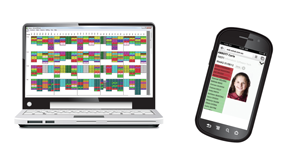 We are a school software company offering solutions for timetabling/scheduling, daily organisation, online subject selections, parent teacher nights, attendance and welfare: a fully integrated suite of systems with seamless data flow. We believe that rigid timetable generation is an outdated method. Requirements based timetabling is the new approach and Edval can deliver this through its powerful algorithms for block line generation, spread management, staffing allocations and rooming assignments. Our solution quality is unprecedented, with flexible tools for curriculum planning and structuring, data rich attendance and welfare systems with fully integrated daily changes, relief teachers, room swaps, excursion, events, behaviour monitoring and recording. We are the preferred timetable and daily management software provider for many school corporations and governing bodies.